Wine & Spirits: Can Do Attitude Joseph Ambrose's Shenandoah peaches land grand prize in St. Germain 4th Annual Can-Can Cocktail Classic. Life of the Party: McCullough at The Hay Adams Best selling author David McCullough comes to town, treating guests of the Hay Adams Author Series to a lecture about his latest work, on the formative experience of Americans living in 19th century Paris. Joseph Ambrose’s Shenandoah peaches land grand prize in St. Germain 4th Annual Can-Can Cocktail Classic. Having the lush Shenandoah in his backyard supplied local mixologist Joe Ambrose with the perfect ingredients to edge out the competition at last week’s St. Germain 4th Annual Can-Can Classic Cocktail Competition held at the W Hotel Washington D.C. St. Germain Liqueur teamed up with Edible Communities, a network of local food publications, to host the event, as pro bartenders from all over were asked to develop original cocktail recipes that celebrate seasonal local ingredients from the entrant’s region. This year’s winner was the Peach Milk Fizz, highlighting sumptuous Virginia peaches in a creative smoked milk punch that hints at the timeless peaches-and-cream pairing. The layers of smoky, sweet, and savory flavors come together easily, as Ambrose suggests, and gives the drink a full-bodied, balanced profile. Like all great cocktails, the milk punch has an equally colorful history. Evidence suggests the milk punch was originally imbibed for its curative properties. Milk was believed to strengthen the ill and alcohol was added to sterilize the unpasteurized milk of the day. Recipes for “milk punch” show up in medieval Ireland and in the works of the notorious female author and spy of the Restoration in England, Aphra Behn. In the United States, the milk punch has roots in New Orleans as the quintessential hangover cure and appears in many early cook books as well as Professor Jerry Thomas’s The Bon-Vivant’s Companion in 1862, the first drink manual published stateside. Founding father Benjamin Franklin even had his own personal recipe for a remedial milk punch that he shared with James Bowdoin in a letter written in 1763. Today, this classic cocktail is undergoing a highly appreciated revival in new and creative ways such as Ambrose’s smoked Peach Milk Fizz. The Peach Milk Fizz is a perfect example of Ambrose’s style. Joe Ambrose. Skiing or mixing? Seasonal Virginia peaches, Bourbon and a playful classic cocktail revisited appeared to be the winning combination. The St. Germain Can-Can Classic Cocktail Competition awarded Ambrose a sweet $10,000 cash prize and an editorial profile in Edible Magazine. Ambrose is the head bartender at the P.O.V. Lounge rooftop bar of the W, where one can enjoy unsurpassed views of The White House while sampling his creations. As a member of the District of Columbia Craft Bartender’s Guild, Ambrose is constantly expanding his portfolio consulting for bars and restaurants while perfecting the latest techniques in the craft. 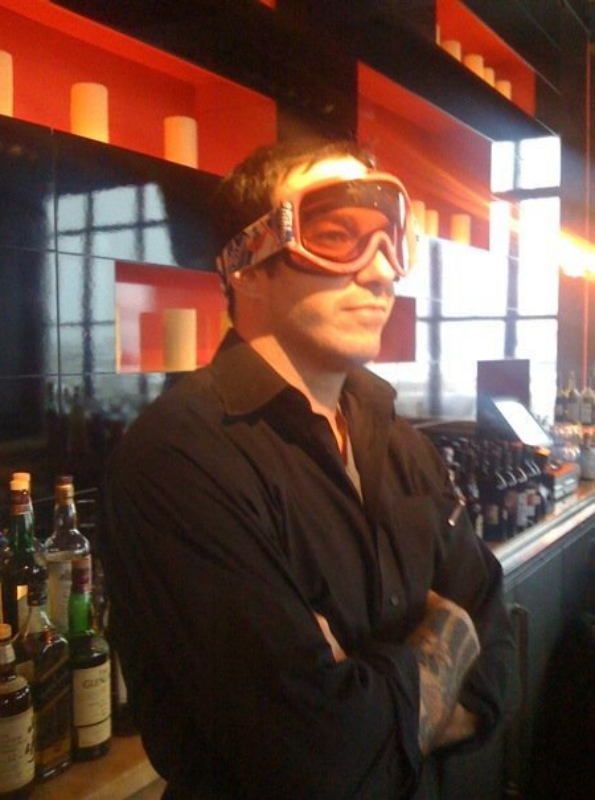 Up next for Ambrose is the 2012 Corcoran Gallery ARTINI contest to be held at the end of the month where he will be competing against 11 other bartenders to create DC’s most artistic martini. Add all contents to shaker except leaves. Whip, then add leaves and ice, shake.